A GIANT BALLOON 100 feet above your business draws can be visible over a mile away. Advertising balloons announce your enterprise to the world! Spot Promotions Helium Advertising Balloons are Big! SIZE reaches to the sky: 5.5 foot diameter single-use helium balloons. Roof top installation and 100 foot of pennant line below, effectively adds 10 stories to your building!!! For less than cost of small newspaper ad, helium balloons add days of visibility for weekend sales or other short-term promotions. Cloudbusters' vibrant colors draw a lot of attention, and can be seen from up to 1.5 miles away. In many business locations, this means hundreds of thousands of impressions. Advertising balloons typically last 2-5 days. These balloons are made of a heavy-duty material called chloroprene, and are specially manufactured for outdoor use. The balloons are a great addition to Roof-Top Inflatables, banners, and other outdoor signage. The balloons can draw attention to a business, and larger signs or inflatables closer to the ground can communicate a specific message. Most advertising is not "actionable." TV ads for restaurants reach people at home, not as they are driving by the restaurant advertised. Balloon advertising is visible by people close to your business. 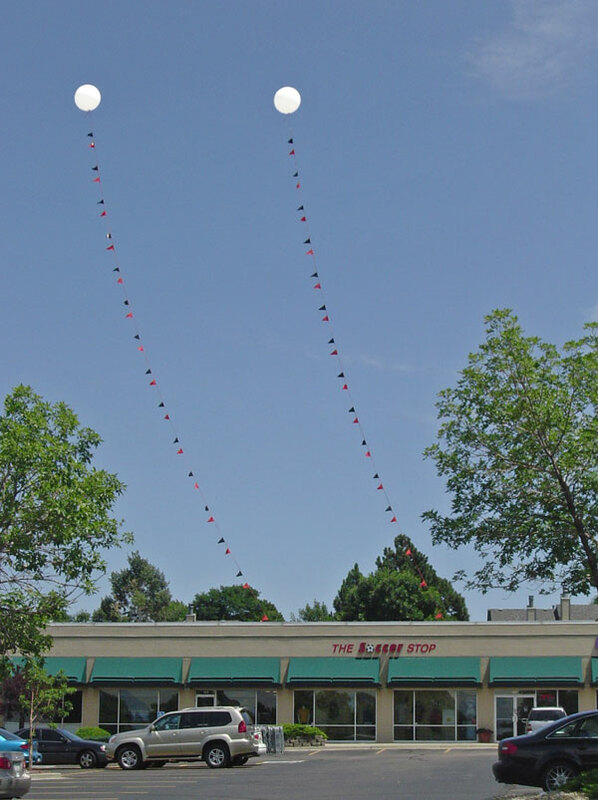 Balloons draw attention to your business storefront, motorists look, and mentally note the location, even if they don't have an immediate need. If the need your product or service later, your business is preferred because they know where you are, and they've seen your business - nobody wants to hunt for a business, and familiarity with your business (even a glance at your storefront) provides you with an advantage over competitors. Helium balloons suggest a sale or special event - whether or not you are having one. That perks curiousity and interest. All outdoor advertising is cost-effective on a per impression basis. But traditional outdoor advertising and signage are profoundly limited by availibility, sign codes, and cost. Billboards on busy highways can cost several thousand dollars per month. Additionally, most Colorado businesses are not located next to a billboard - to serve as a "directional" the billboard will have to give written directions. That's much less effective than a helium balloon that says "we are right here." Motion is effective for all forms of advertising and outdoor advertising is no exception. Even light breezes will cause helium balloons, and their attached pennants, to move. This is superior at drawing visual attention, even when compared with much larger traditional outdoor advertising or signage. Height! By rising above buildings, traffic, trees, and signs, helium balloons stand out and command attention.